There is a very intriguing school of thought regarding brain size and Alzheimers/dementia. Undertaking autopsies on elderly it was discovered that some people should have had major alzheimers symptoms as their brain was full of dead bits (physiological manifestation of alzheimers) yet these people showed no outward signs of alzheimers. This lead to the development of a theory called brain reserve / cerebral volume. This theory states that larger certain parts of the brain, the more can be "eaten" up with alzheimers before clinical signs of alzheimers states to occur. 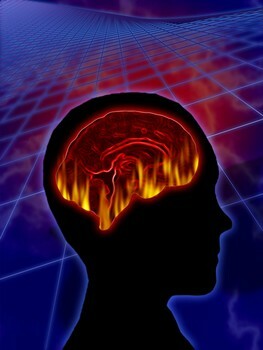 A recent study shows that you need to use it or lose it also applies to brain function as well. They found that "Education, occupation attainment, and leisure activities" all contributed to brain reserve. Interesting that education, which generally occurs earlier in life effects brain reserve later in life. Occupational attainment is an interesting one as anyone can climb the ladder, so to speak, in their profession. When this occurs people generally have more complex problems to solve, so increased brain function could be expected. Again leisure activities generally either us the thinking mind (eg board games or jigsaws) or "physical" part of the brain (eg hand eye coordination). There could also be some cross over, eg you need a strategy, or able to read the play in a team sport. So use your brain or lose it.